Oh, how I love the Spring... Every year I feel like it literally passes by so quickly here in Southwest Florida. Our 80-90 degree weather is upon us. We are seeing our daily afternoon spurts of rain. I cannot complain, however, because we see that the birds are chirping and butterflies are all over our passion vines. In our house we've been bird watching with our freshly built bird feeders. Our regular feathered guests are mostly Red Cardinals and Blue Jays. It's been so nice to enjoy seeing nature in our own back yard. Thus, I've been doing a lot of research on building a kid friendly backyard that is consumed with our own personalized bits and pieces of enjoyable fun. I have found amazing things consisting of recycled tires, pots of flowers, and beautiful bird houses. 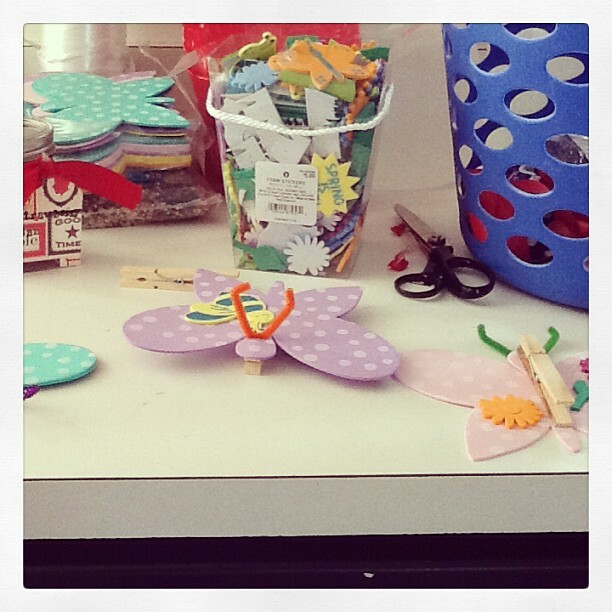 Here are some fun butterfly clips that we did for our "spring" unit. My participants include my three year old son and my six year old who adores them just as much. 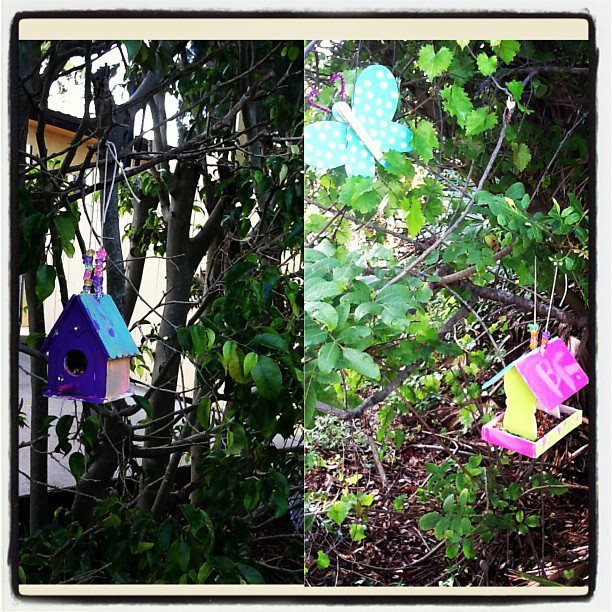 We placed them alongside our bird houses and they are oh-so, beautiful! My next project is definitely going to be converting a corner of our yard into a simple and shaded reading nook. If the ants will allow, of course. This Toddler Planner has been broken down into four weeks, and then broken down by development and activity details. It super easy to use. You can print it or use it virtually. The choice is yours! I did a comprehensive study on what the average two year old milestones are and how to incorporate this into lesson plans. Two days of toddler learning a week is going to be our starting point for Tot Spot activities; anything more, would be torturous to my very active two year old. The topics are very basic and cover all subject matters tailored, by you of course, to incorporate any form of activities for those topics. You can personalize your activities, use online resources, or Pinterest to find great teaching activities, games, and printables for your babies. Or, you can keep it very very simple. If it is a sensory topic, you can gather different textures from your linen closet and talk about the textures with your eager tot. Simple. If you are interested in further information regarding the resources for lessons, and how I selected what topics to focus on in the two days that we are going to teach then I can provide them to you upon your request. I hope that you are able to enjoy this planner- and that you are more than willing to share ideas on adjustments that need to be made or tips on what you think needs to be changed. I have found such wonderful idea's on Pinterest that I was able to successfully plan my son's birthday, which was in March. The theme was "What Little Boys Are Made Of." I wanted to incorporate decorations that we would be able to place into his room after the party was over. Everything turned out lovely! ...We blew up balloons and snuck them into Mark Jr.'s room the night before birthday... He was thrilled upon waking! We served a veggie platter, which we labeled the "Snail's Garden" and "Dirt Pudding", which was chocolate pudding with oreo's, and candy worm's. Puppy Cupcakes. Thank you, Pinterest! Notice the baby book. Since my kids were born, I have every guest sign their baby book's with a personalized message. Birthday banner with pictures from birth until age 2. I love this! I used jute, small clips, and vintage inspired scrapbook paper from Joanne's. These were scrap pieces of wood. :) Recycle! It was a complete success! I cannot believe my baby turned two years old. The theme was perfectly coordinated with the help of fellow bloggers and Pinterest users. Thank you! At our house, we love this time of year for giving, receiving (because what kid doesn't!? ), and for creating presents. Every year we've made our own ornaments. Last year we made salt dough shapes and decorated them with glitter. We also made some cinnamon ornaments. My babies are getting so big. Every year I have made a mold of their hand print so this year I started looking for to incorporate something to this regard into an ornament for Christmas. And then..I came across this beautifully simple and elegant snowman fingerprint ornament from Pinterest. I used this homemade clay recipe. It was extremely easy to make and didn't take much time. You combine about a box of baking soda, one cup of cornstarch, and one and a half cups of water. Combine all of the ingredient and then cook on medium heat until the mixture thickens-stirring consistently. If you do not want to create your own clay, you also easily purchase clay from the craft store. *The clay took about three full days to dry and while it did, I decided to keep rotating and flipping the ornaments. Note to future self. Be careful because this recipe causes uneven cracking to the point of no return. I bought a sealant for the ornaments because I noticed the cracking and that seemed to slow down the process. Unfortunately, some ornaments just didn't make it! Aside from that.. they still came out looking beautiful, simple, and so very honestly made. Mark Jr. has the reindeer ornaments and Harmony's are the snow ladies. 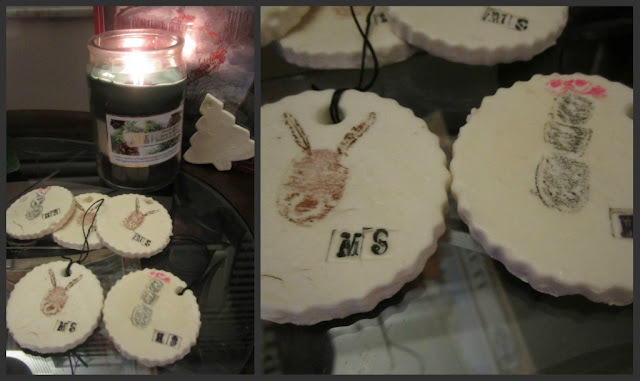 We stamped their initials, which I would recommend waiting until AFTER the ornaments dry.. something I clearly didn't do. Punch a hole for the string and then light brush over the finger print area with crayons or paint until it becomes visible. We waited about 2-3 days until they dried and then sprayed them with a sealant to protect the exterior from cracking. Harmony and I really enjoyed creating these and plan to give them away to friends, family, and to her teacher as Christmas gifts. 2011 Year in Review Newsletter. Harmony and I have really enjoyed learning the Christmas story and about Jesus' birth. We've been using our book, Truth in the Tinsel: An advent experience for little hands, and have been following along with each new section of the story each day. You can see more about our journey with this project about learning The Christmas Story.. Here are a few photo's of the daily ornaments that we have completed. The above photo is of Mary, Joseph, the stable, and the manger. Isn't it just lovely? We learned about the meaning of Jesus' name. This is a pillow that signifies the dream that Joseph have and how he was told to marry Mary, and that her baby would be called.. Jesus. Tot Spot: Build a Snowman! I printed out this snowman that I found on Pinterest and placed it between two sheets of contact paper and then I cutout the pieces. The whip-up time was about ten minutes total and that's because I had to COLOR the pieces in so we can start practicing identifying colors. This was super fun and TOO easy to create! You can't beat that! Copyright © 2010 Rattles and Redheads. All Rights Reserved. Simple theme. Powered by Blogger.